I had hoped to have some pictures of a wedding I did recently at the Queen Elizabeth II Botanical Park. but as we say in Cayman...soon come! 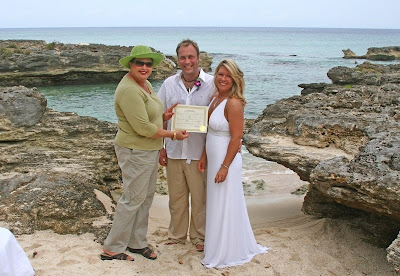 Not every bride wants a sunset wedding on Seven Mile Beach, as beautiful as that can be. In the same vein, not everybride wants a Tropical Bouquet. 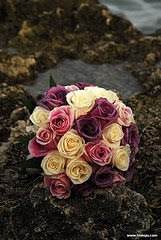 Particularly if you are wearing a traditional formal wedding gown, the bouquet below MAY be more appropriate. I have had recent brides chose this bouquet in all white roses, and white and cream roses, equally stunning. 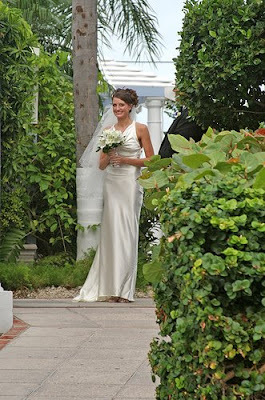 This bride chose to be married at the Wharf Restaurant, on their little beach. This is a favourite spot of mine because the staff are so accomodating, and easy to work with. Then of course you can have your wedding reception right there on their beach patio, or inside in their air-conditioned dining room. 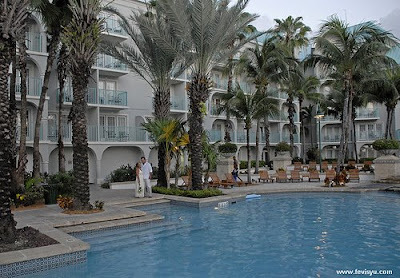 This is a shot of pool-side the Westin Casaurina Hotel. Sometimes if you have a largish group with elderly family members you might not want to traipse down to the beach, in which case the Westin poolside is a good alternative, you can always do beach pictures afterwards. This is the ultimate in "simple" and "private", we had to ask a lady from the adjoining property to come and be a witness and she was happy to oblige. I thought this was the perfect dress for the occassion, simple yet elegant. This bride had her make-up done at the new MAC store in Bayshore Mall while she was waiting for me to get the Special License. She told me one of the salesgirls asked her "Is Joy doing your wedding? She did mine." I really do appreciate all the "big-ups" I get from the ordinary people you meet in Cayman, the taxi-drivers, the bell-boys, the sales clerks, the waiters etc. Many of them have attended one of my weddings, and word of mouth is my best advertisement. Of course my best advertisement comes from the many photographers I work with, first among equals (not really) my dear friend Fevi Yu, whose fantastic work enables me to show our islands to the world in a much more personalised way than the tourist brochures.